Each year, May through October, the Mediterranean has been SeaDream’s go-to destination. Whether it be Italy, Greece, France, Spain or Croatia, the sun is shining, the sea is warm and coastal towns are abuzz welcoming visitors. If you haven’t been to Spain, here are a few reasons it is so popular; sandy beaches and sunshine, culture, historical monuments & Moorish palaces, nightlife, world-famous food & wine, Flamenco dancing, Dali & Gaudi. 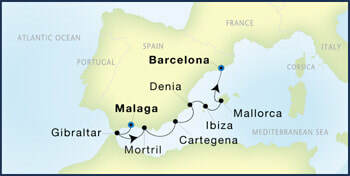 Below are a few of SeaDream’s favorite ports. 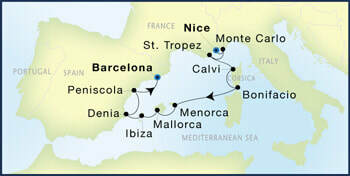 ​Ibiza Town is the largest city on this 3rd largest Balearic Spanish Island. It lies 79 kilometers (49 miles) off the coast of Valencia, in eastern Spain. The first inhabitants of Ibiza date back to 2000 BC. UNESCO designated four island locations as World Heritage Sites. 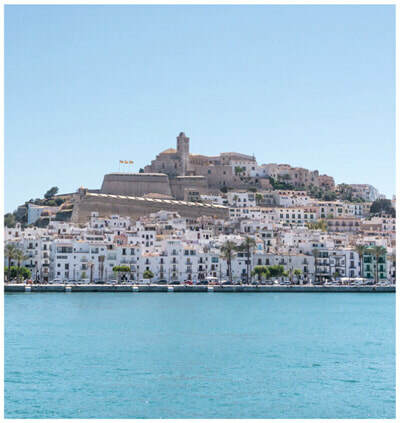 Join a SeaDream Land Adventure and discover the Dalt Vila Acropolis, the best-preserved coastal fortress in the Mediterranean. Enjoy traditional cuisine at charming waterfront cafes and be sure to sample their local wine, virgin olive oil and peasant bread. The island is green with pine forests and fragrant with rosemary, thyme and lavender growing in abundance. Music and nightlife have become synonymous with Ibiza. If staying late in port, people watching and celeb sighting is first class. 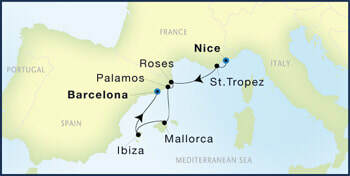 Palma is situated on the southern coast of Mallorca. 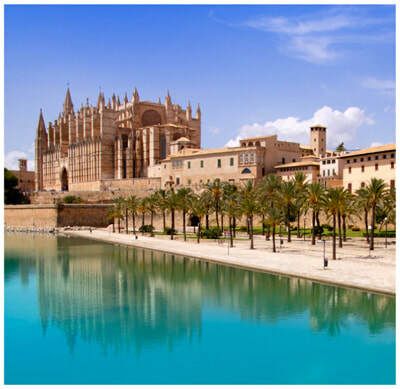 In 1983, Palma officially became the capital of the Balearic Islands. 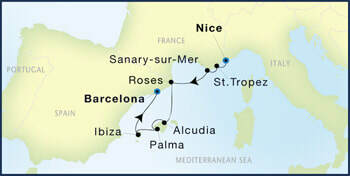 Attractions include the city’s dramatic seafront Cathedral, La Seu - which was constructed in the 13th century and took almost 400 years to complete; the Parc de la Mar - a tiered park offering beautiful views of the waterfront; and the grand Almudaina Palace - a formal royal residence dating back 700 years. The beaches are stunning and the mountainous roads are ideal for avid bike riders. Monasteries and castles, marshes full of wildlife for birdwatchers, museums and legendary nightlife; there is something for everyone on Mallorca. Puerto Banus, Spain is a luxury marina located south of Marbella, on the Costa del Sol. 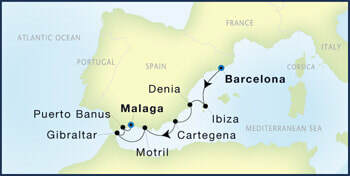 Developed by Jose Banus in 1970, the upscale marina attracts the who’s-who of international wealth and celebrity. The mega-yachts docked here are spectacular, as are the exotic automobiles belonging to the yacht owners and the visiting jet-set. Surrounded by chic shops, restaurants and bars; it’s a scene like no other. SeaDream is the only commercial vessel allowed to dock at port.